In Nigeria where English is being taught and learnt as a second language, the use of vernacular by students, especially secondary/high school students, in classrooms or within the academic environment is highly prohibited. Instead, students and teachers are instructed to communicate with one another in English Only. This is an instruction they must follow strictly. In fact, students and teachers who act otherwise are usually fined and given query letters respectively. This is a common fact every Nigerian student can attest to and way of ensuring that students are well grounded in the language. 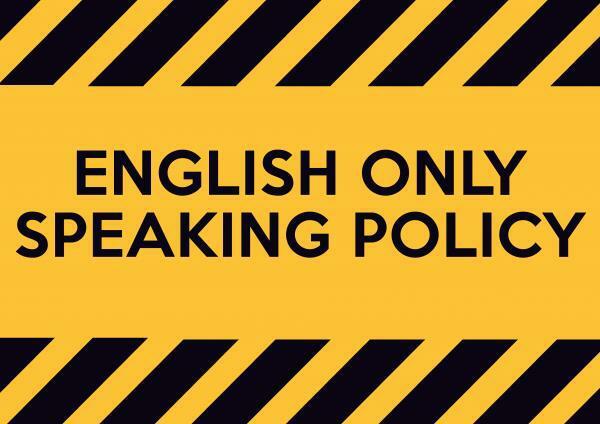 The ban of mother tongue (MT) usage in ESL (English as a Second Language) classrooms has resulted to an inconclusive debate that has lingered for so long among supporters and opponents of the English-Only policy. According to Brown (2000), the debate over whether learners’ mother tongue should be used in English classroom or not has been a contentious question for years, but the findings of researchers have not been entirely persuasive. This article only unravels such argument. English-only in an ELS classroom will not only expose the students to more English but will also enable them to gather feedback from errors they commit as well as errors others commit. By receiving corrective input through this exposure, they can hypothesize how the language works and test these hypotheses. That is to say that English-Only in an ELS classroom facilitates proficiency through exposure. No wonder Krashen (1985) opined that learners’ use of L1 (mother tongue or native language) in class could contribute to impede the success of exposure in facilitating proficiency. One of the major claims from the advocates of the English-Only policy is that the learning of a second language (L2) should model the learning of an L1 (through maximum exposure to the L2). Students most often will take the easy route and speak in their native languages because they are easier. According to Cummins and Swain (1986, in Dash 2002), if the mother tongue is used together with the second language, students would tend to tune out the one which they felt uneasy about, and it would be detrimental to L2 (English) learning. However, English-Only classroom keeps the native language from dominating and puts more emphasis on the language being learnt. 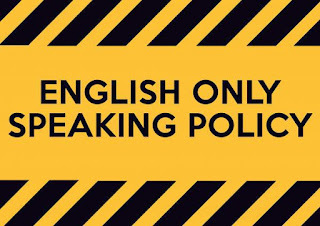 Requiring students to speak only in English in an ESL classroom will help them become more comfortable and confident in expressing themselves in English. Sometimes, using the keywords in the target language (English ) and the native language will create understanding among the students. Also, providing directions with certain keywords in the native language helps the students understand what to do. It is found that students who are allowed to use L1 had acquired L2 faster than students who used only L2 in their classrooms (Auerbach, 1993). This is not to promote speaking or fully give directions in the students’ native language for prolonged periods of time, but occasional use will not hurt the students’ use of the L2. Therefore, imposing English-Only policy will only lead to students’ incomprehension and resentment. Harbord (1992) drew our attention to the fact that many language teachers have tried to create an English-Only classroom only to realize that they have failed to get the meaning across, leading to students' incomprehension and resentment. With struggling lower-level students, this is especially evident. Instruction in English only simply leads to their frustration (Burden, 2000), and this automatically creates a barrier and unnecessary tension between students and teachers. The alienation of students from the learning process will then come as an inevitable consequence (Patchler and Field, 2001). The biggest problem with the English-Only policy to teaching English as a Second Language (ESL) is that it is very impractical (Phillipson, 1992, p 191). One reason the exclusion of L1 is impractical is that the majority of English teachers are not native speakers (Hawks, 2001, p. 50). Sometimes, the English of the teachers is not very good, and by insisting on an English-Only policy, we can severely undermine their ability to communicate and consequently their ability to teach. Enforcing the sole use of the Target Language (TL), which is English in this case, can often lead to a reduced performance on the part of the teacher and the alienation of students from the learning process (Pachler & Field, 2001, p. 85). If students are restrained by language, then those who do not possess the language will remain quiet. However, if the students are able to speak the native language and receive feedback from other students or educators, they will know more opportunity to use the target language. As Auerbach (1993) observed, students who are unable to participate in English-Only classroom will have an opportunity to study using both their L1 and L2. Monolingual teaching or English-Only policy can create tension and a barrier between students and teachers, and there are many occasions when it is inappropriate or impossible (Pachler & Field, 2001, p. 86). When something in a lesson is not being understood and is then clarified through the use of L1, that barrier and tension can be reduced or removed. According to Auerbach (1993), using L1 reduces barriers to language learning and develops rapport between teachers and students and between the students themselves. Some students, especially lower-level students, will feel burdened by their inability to speak in the language. This can lead to a decline in confidence and demotivate the students from participation. Harbord (1993, p.354) gave three reasons for using L1 in the classroom: facilitating communication, facilitating teacher-student relationships, and facilitating the learning of L2. Cook elaborated further by stating that teachers should use L1 to convey meaning and organize the class. Students can use it for scaffolding (building up the basics, from which further learning can be processed) and for cooperative learning with fellow classmates (Cook, 2001, p. 410). Perhaps the biggest reason for using L1 in the classroom though is that it can save a lot of time and confusion (Harbord, 1992, p. 351). While arguing for the option of using L1 in the classroom, most researchers have at the same time cautioned against the overuse of it (Burden, 2000, p.9) because it can create an over reliance on it (Polio, 1994, p.153) and can oversimplify differences between the two languages, create laziness among students and a failure to maximize English (Atkinson, 1987, p. 247).